Bible Answers: Why Did God Accept Abel’s Offering and Reject Cain’s Offering? (Ver 1.1) This quick Bible lesson is the answer to a very common Bible student’s question. We usually all have very similar questions when reading the Bible, so I will answer this question from one person and believe that it will help others that were not brave enough to ask the question. I find it interesting that people will ask you questions as long as you give them the answer that they wanted to hear. But if I say something new or controversial that God has taught me from the Bible, the responses can be very diverse and unexpected for a Christian. I have had some people unfriend me or just stop talking to me because I didn’t agree with what they viewed as the only truth in the Bible. If we are not open to learning something new and greater from God we will all remain in a stagnant state of ignorance apart from what He desired us to know. Today, we are going to analyze the information given to us by God surrounding the story of two brothers. Regardless of what you already think that you know about this story please leave your pre-conceived expectations behind and focus only upon what God says in His Word. Be open to the Holy Spirit and be led by only Him. The Absence of a Blood Sacrifice from Cain. The Poor Quality of the Offered Sacrifice of Cain. The Heart Issue of Cain’s Attitude Giving the Sacrifice. All of these are legitimate ways to look at the story from a student’s viewpoint of the text. However, we should not attempt to say that any one of these is more important than the others because they are all contributing factors. The story of Cain and Abel quickly becomes a war of human opinions and my opinion is as totally worthless as your opinion. Therefore, we need to learn God’s opinion. What does God say about it and how do we even begin to find it in the Bible. That is the number one reason why people do not understand the Bible correctly. They read an isolated passage in Genesis 4 and ignore the whole rest of the Bible. That is a crazy way of studying the Bible. I heard one preacher say we should only study one book of the Bible at a time and I thought that was a foolish way of studying a book that was designed the way the Bible was written by God. The Bible is progressive revelation. What is hidden at the beginning is uncovered at the end. Therefore we cannot understand any of it without taking into account what is written in every part of the Bible about the subjects that we are studying. If you don’t have a good Bible software program on your computer get one. There are many that are free and I recommend one called eSword. Then search the Bible for the subjects found in Genesis 4 like the names of Abel and Cain and read what God says about them. For example, Abel is only referenced directly a few times but the statements describing him are infinitely important to why God accepted his offering and not Cain’s. Get your Bible search software and let’s get started with the story of Cain and Abel. Cain was the firstborn of Adam and Eve. That fact is interesting but not significant for this Bible lesson. Abel was revealed to be a keeper of sheep and we all know lambs come from sheep. Thus we have the foundation beginning for the belief in the assumption theory number 1 concerning the blood sacrifice, but we won’t go there. Cain as you can see is a ground laborer and that is just another name for a farmer. Let me ask you, how would a farmer of crops give God a blood sacrifice of something that he does not possess? I think that is a problem right from the beginning. Are we expected to give from what God has given to us or does God expect us to give what we don’t have just to please Him? A mindset of religious works would demand that we must do specific works of the flesh in order to be pleasing to God and I do not believe that is the revealed nature of God. I think you should think about that for a while before you answer. As you can read both brother’s offerings took time. Animals are not an instant miracle either. A lamb can take 150 days to be born. Therefore both offerings presented to God could only come after time. There are certain keywords given to us by God that are important. 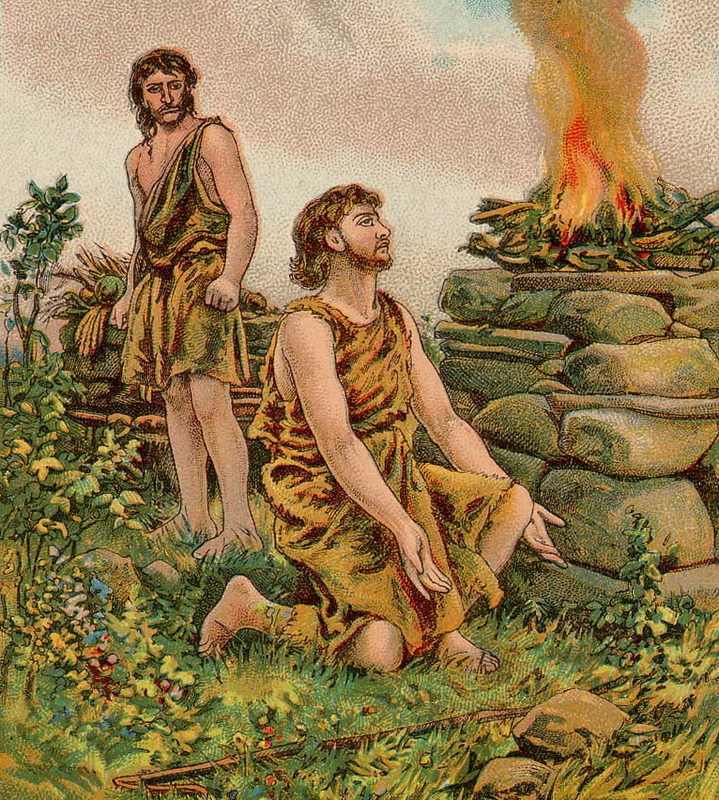 The term “firstling” and “fat” are two keywords that have significance to describe Abel’s offering to be remarkably different than his brother’s. The term firstling means the first born and that is significant. The term “fat” literally means the best. Here is where we get the foundation for assumption theory number 2, the insufficient quality of the offering of Cain. Abel brings God the firstlings of his flock and the fat thereof. The absence of any adjective qualifiers describing Cain’s offering implies them to not be special. Then notice that it says God had “respect” for Abel’s offering. As you can see God had no “respect” for Cain’s offering. Here we can also read that Cain’s attitude was not very positive. He becomes angry and depressed and those seem to support the theoretical assumption number 3 that Cain failed God expectations with his wrong attitude. You can quickly see how each theory has a basis for beliefs and why they are taught in churches. The only theory that I have not touched on is assumption 4 concerning the principle of the sovereign choice of God. There are endless numbers of Christians that place everything that happens in the world in the hands of God’s design, purpose, will, and plans and they leave nothing out for us to do or for any contribution of Satan or evil spirits to be involved. I call this the response-less devil and human theory. No matter what they do it makes no difference because God’s will is always done. These types of Bible teachers go with theory 4 so that they do not have to teach any human responsibility or accountability. These types of teachers also have to attribute every evil in the world to be a gift from God. I was on Facebook the other day and I saw a very ignorant statement. This person said God sent the storms so that He could prove that He was the only protection from the storms. That sounds very religious but that is not my God and people really need to read the whole Bible. I’m not going to go there fully but I will show you a few verses that counter this wrong belief concerning the sovereignty of God. The Greek word that is translated as “respecter of persons” in this verse means to have partiality for one individual and not for the others. It would be like a teacher in school picking one child as their favorite and the others are not treated equally. Being partial clearly is a conscious decision to show bias, prejudice or preference for one human and not do the same for another. This would be like two men walking into your church. One is dressed in rich apparel and the other is dressed in rags. The ushers could treat both men the same and be like God or they could take the wealthy looking man to the front and sit the raggedy man in the back of the church and that would be an example of being a respecter of persons. Showing favoritism would be preferential treatment for one while exhibiting inferior treatment for the other based solely upon their appearance. According to scriptures in the N.T. God is not a type of God that respects one individual over ANY other. We can clearly read that here in Acts but it is also found in Romans 2:11, Ephesians 6:9, Colossians 3:25, and James 2:9. That is 5 verse witnesses in the Bible that teaches us the truth about God and you should not ignore them. Here is an excellent verse that will apply to what we have just read in Genesis 4 about Cain and Abel. God says that He does not respect any specific individual but that He does judge their works. This is a commonly ignored verse in the Bible. This was written to Christians but it does apply to all of the people of the earth, past, present and future and it definitely has an application to what God says about Cain and Abel. If God does not respect a person or an individual but rather will show respect for their works what was it about Cain’s works that were rejected and Abel’s works that were accepted? Doesn’t that change the perspective of the story significantly? That is what we are talking about in the story, right? The fact that both men gave an offering and one was pleasing to God and one was not, that tells me a lot. There are three basic ways to judge a person’s work. A person’s work can be judged for what they did, how they did it or why they did it or a combination of all of these three. Did you know that you can do the right things at the wrong times or in the wrong ways or even with the wrong motives and still be found guilty before God? It goes back to a question that I used to ask job applicants during the interview process where I worked. I always tried to ask them, “What matters more the end result or the methods used to achieve the end-result”? You see in every business if the end-result was the only thing that mattered then we could all lie, cheat, steal and rob to get the job done. Recently in the news Lance Armstrong came out in public and said that he had used banned substances to achieve his 7 bicycle race victories. He clearly viewed the end-results to be more important than the methods to achieve them and now he is paying the ultimate price. This was probably not the wisest thing that Lance ever did. What I am teaching you, is that matters how you do something and why you are doing it, more than it does getting it done to God. Did you see it? God says the sacrifice that Abel offered was “more excellent”. So clearly sacrifices of lambs are better than fruits? But is that what it really says? What did God say directly before that statement? Doesn’t God tell us of Abel’s motivation and methods? How did Abel offer this more excellent sacrifice? God says Abel offered it “By Faith”. The implication given by God is that there was a factor missing from the offering of Cain and this factor was his faith. You see if you read down in Hebrews 11 you will find a revelation that directly applies to the story we read in Genesis 4. The way I read His statement, He is looking for a people with faith that pleases Him when He returns. So when you so dearly ignore the subject of faith in the Bible you just might find yourself to be more like Cain and less like Abel and that is not a good place to be. What company do you wish to associate? Which example do you wish to demonstrate to Christ? Your name could be with the others in the Faith Hall of Fame. It is really up to you more than you think. If you wish to be pleasing to God then you need to learn the subject of faith. Did you notice what these verses said? They are speaking of sacrifices but not the blood types like an animal or a lamb. No, God is saying offer up the sacrifice of praise unto Him. Wow, that is very strong isn’t it? It appears that God still desires us to make a sacrifice but with the fruit of our lips. Uh oh! What did Cain offer God? Was it not the fruit of the ground? What are your lips made out of? If you did not know it, your lips are made from the ground also and these produce fruit for God. Why did God reject Cain’s offerings of fruit but still desires the fruit from our lips? I pray that you are learning something new. God just got through talking to you about the whole long subject of faith in chapter 11 and now in chapter 13 He connects that with your sacrifices which are still required. Do you believe that whatever sacrifices you give to God that you better do them in faith to be accepted? I seriously think that would be a great idea. What did we read in Hebrews 11:6 that pleases God? Without “faith” it is impossible to please Him and therefore faith pleases God. Even though you are doing something that could please Him like praising Him with the fruit of your lips, if you are going to do it without faith it will not be found pleasing. I just did a quick Bible lesson on the importance of your faith and giving God your sacrifices today. There is more to the story of Cain and Abel than this, but that was the message from the Lord for you today. Abel through his faith in God was called righteous and his name is mentioned in some elite company. If you think it is too late for you to be added in this group I believe you are wrong. Thank you for reading my Bible lesson. May the love of God become known to you in new ways that are beyond your natural comprehension! If you have any Bible questions that you like for me to see if I can answer please provide them in a comment and as I am led by the Spirit of God I will address them. God Bless!